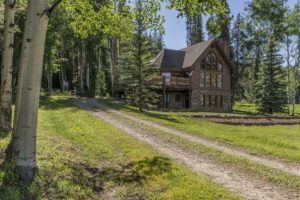 Bordering Routt National Forest with end of the road privacy and incredible views of Steamboat Lake and Hahns Peak this pristine retreat sits on 35 acres. Comfortable mountain home includes 2 main level bedrooms each with bathroom and an additional bedroom downstairs for guests. snowmobile/atv ramp is perfect for storing all the recreational toys. New roof in 2013, this home is in excellent condition and is the perfect starting point for Big Game hunting and all recreational activities. All types of wildlife visit for your viewing pleasure.